- Marco Arment on the rumored Apple tablet, in response to John Gruber’s epic take on the device. Via Minimal Mac. Posted by davelawrence8 at 6:57 am on January 8th, 2010. 2 comments... » Categories: rumors. Tags: apple, islate, itablet, messagepad, newton, PDA, tablet. Subscribe via RSS. “The coming of an Apple tablet has been rumored since the death of the Newton. Talk to anyone versed in Apple lore, and they’ll tell you one’s just around the corner. Not only that, they’ll probably tell you what it’ll be like. - The Macalope on the spread of rumors about a device no one has even seen yet, and how rumor-spreaders have been wrong (way wrong) before. Posted by davelawrence8 at 6:40 am on December 22nd, 2009. One comment... » Categories: rumors. Tags: apple, ipad, iphone, itablet, macelope, newton, rumors, tablet. Subscribe via RSS. Is this the new, rumored Apple tablet? Or an old patent filing from the MessagePad days of yore? The Next Web’s Boris says it’s an old Newton patent resurfacing, and that the rumored Apple tablet will not have stylus-based input. Little clues, like how the patent isn’t about a tablet but the stylus recognition system itself, and how weirdly familiar that bottom row of buttons looks, seem to say Boris is right. These new patent pictures were released into an online hornets nest, with everyone waiting for news on this long-rumored iSlate thingy. Any clues, no matter how old or mundane, turn into a tea-leaves-reading session. 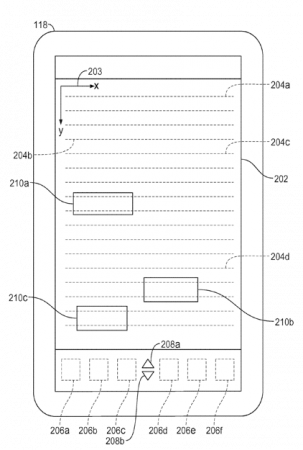 Thing is, Apple applies for wacky patents all the time. 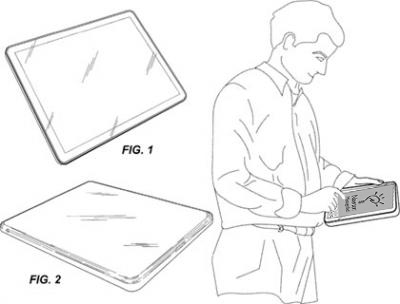 We’ve seen other patent pictures floating around the Web for years now. None of us know if this new, still-unseen Super Newton is anything like what we’ve seen before. What do you think? Is this a new tablet, or an old MessagePad? Posted by davelawrence8 at 8:05 am on November 16th, 2009. 2 comments... » Categories: rumors. Tags: apple, e-ink, input, itablet, messagepad, newton, patent, pen, rumor, stylus, tablet. Subscribe via RSS. Connected Internet has a discussion of how the Newton was simply waiting for the right technologies to come along. It was task enough to make a portable computer, let alone a handheld one. Even if a practical tablet could be made, the price would be way too high for mass adoption at any level. Plus, what would the users have done with it? The Internet was nowhere near its current reach and digital content was still pretty much scattered all over the place. Forget online social networking. I often hear that the Newton was ahead of its time, which can make us Newton users feel good that we’re using an advanced-at-the-time product. That, combined with its personality, makes a MessagePad or eMate a lot of fun. Now we’ll see what tech companies do with touchscreen, tablet-like devices now that all the factors – technology, software, price – are coming together. Posted by davelawrence8 at 6:54 am on October 15th, 2009. No comments... » Categories: newton, newton history, rumors. Subscribe via RSS. 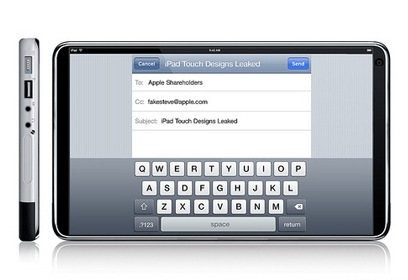 One possible outcome of the Apple tablet rumors. Posted by davelawrence8 at 6:41 am on October 13th, 2009. No comments... » Categories: humor, rumors. 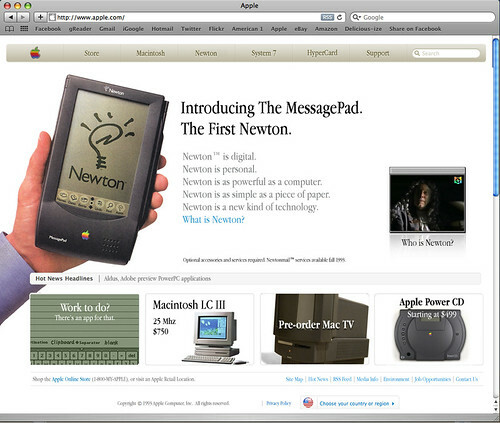 Tags: apple, humor, joy of tech, messagepad, newton, pro, tablet. Subscribe via RSS. Also likely is an introduction of iTunes 9, which has widely been rumored in recent weeks to make its debut with a handful of social networking features. Nothing is expected to be heard about the much anticipated Newton Web tablet, which isn’t expected to surface in any form until the first calendar quarter of 2010. Hilarious. Apparently Barylick doesn’t agree with me or any other Newton fan who realizes that the rumored Apple tablet will not, in fact, be called a Newton. Posted by davelawrence8 at 6:29 am on August 28th, 2009. One comment... » Categories: rumors. Tags: apple, itablet, itunes, newton, powerpage, rumor, splorp, tablet. Subscribe via RSS. 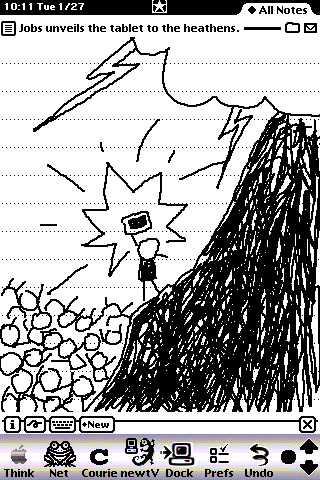 It may have only been in jest, but Larry Dignan’s suggestion that the rumored Apple tablet be called a Newton seems a bit far-fetched. But ZDNet’s editor isn’t the only one mentioning both devices, one true and one maybe true, in the run-up to some Apple product that has more possible release dates than Smile. I haven’t dipped in to the Apple Tablet pool because, just like the iPhone before it, we have little way of knowing what it will include, how much it will cost, when it will be unleashed, and what groundbreaking new whiz-bang feature it will release upon the world. There’s just no way. 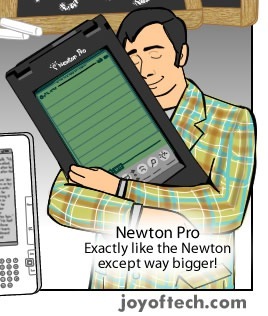 And frankly, Apple isn’t going to release another “Newton”-named product in this lifetime. This is not a company who relishes in the past, and certainly not one who would want to revive a questionably-successful product’s name when another would do just dandy. Posted by davelawrence8 at 5:42 am on August 25th, 2009. 4 comments... » Categories: rumors. Tags: apple, blog, itablet, messagepad, newton, rumor, tablet, zdnet. Subscribe via RSS.